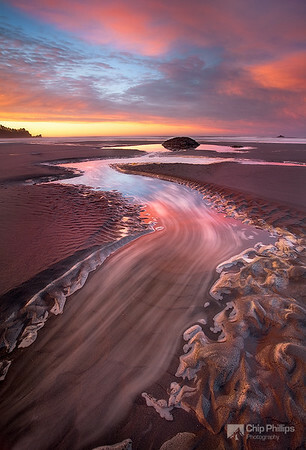 "Pistol River Sunrise" Pistol River, Southern Oregon Coast. 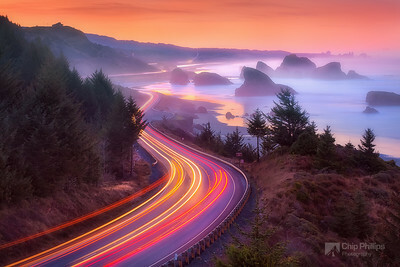 A very long exposure was used to capture the light streaks of passing traffic on Highway 101. 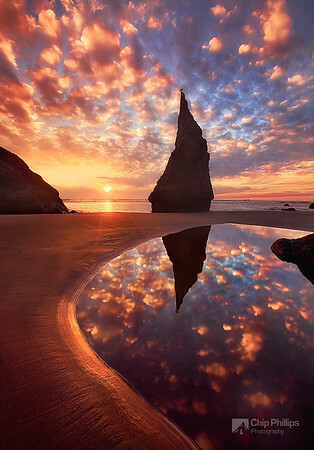 "Wizards Hat, Bandon, Oregon Coast" One of my favorite sea stacks on the Oregon Coast. 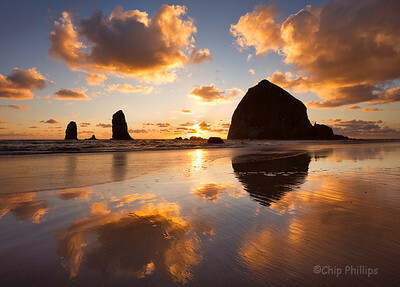 Shot from the beach in Bandon at sunset. 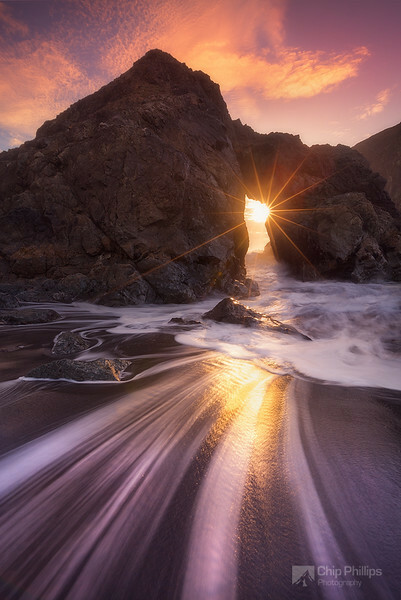 "Southern Oregon Coast Sea Arch" Only a few days a year, the light shines through this arch. 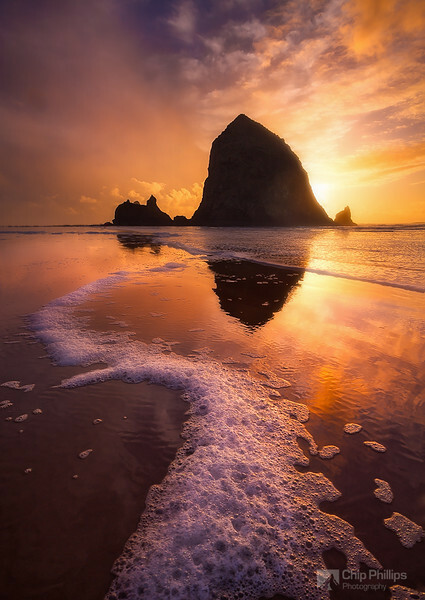 It isn't accessible at high tide, so it's important for things to line up. 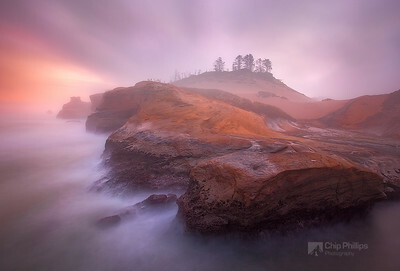 On this evening, I was happy to have the conditions that I did. 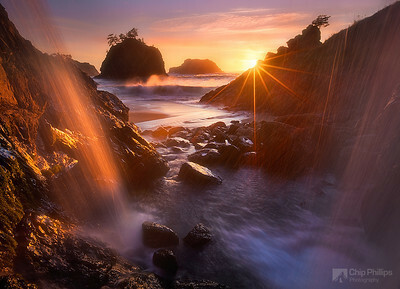 "Ocean Waterfall Oregon Coast." 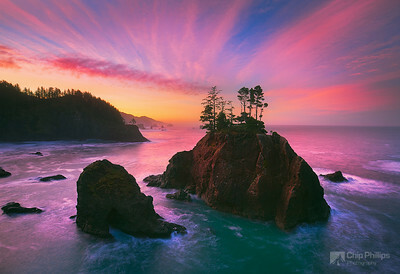 Sea Stacks at sunset shot from behind a waterfall on the Oregon Coast. 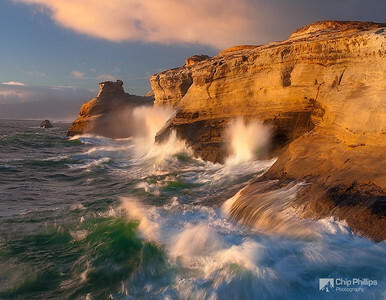 "Crashing Sea Cape Kiwanda" Rough seas captured at sunrise from Cape Kiwanda on the Oregon Coast. 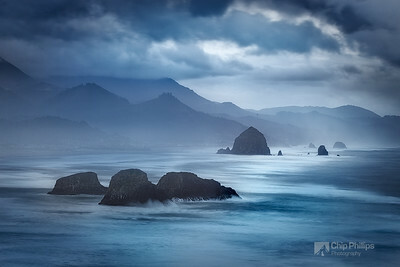 "Ecola at Dawn" A stormy morning in Ecola State Park, just North of Cannon Beach, Oregon. 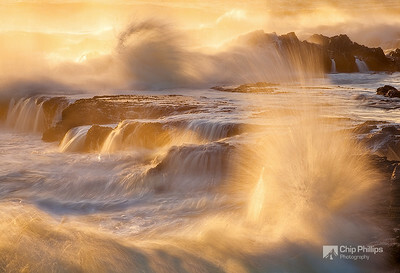 "Second Beach Sand River" I was able to capture motion in this slowly moving sea foam with a very slow shutter speed. 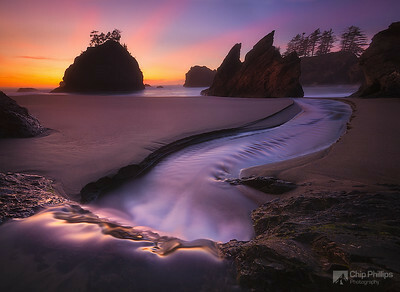 Taken at low tide in Olympic National Park of Washington State. 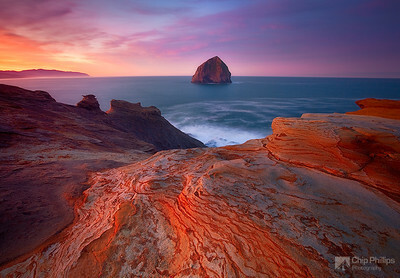 "Cape Kiwanda Key Hole" A natural arch on the less photographed side of Cape Kiwanda. 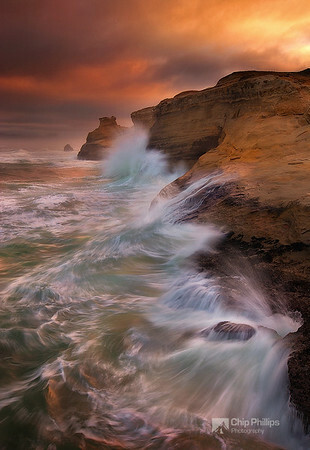 Pacific City, Oregon Coast. This arch is no longer standing. I'm thankful that I had the opportunity to photography it while it was still there. 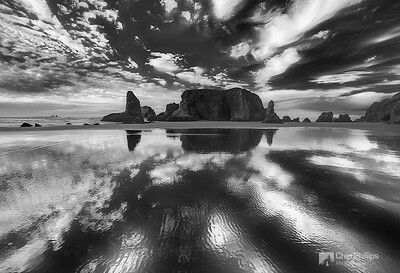 "Black and White Cloud Reflections, Bandon Oregon" Clouds reflecting in the sand shortly before sunset in Bandon on the Oregon Coast. 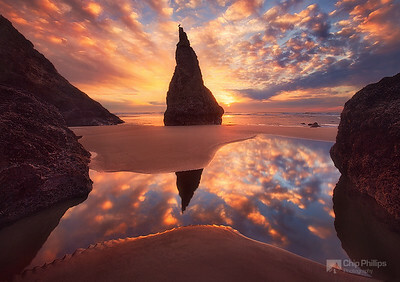 "Vertical Wizards Hat, Bandon Oregon" A vertical shot of my favorite sea stack on the Oregon Coast, with a little visitor on top! 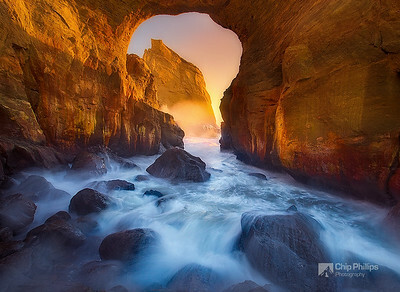 "Southern Oregon Coast Sea Arch"
Only a few days a year, the light shines through this arch. It isn't accessible at high tide, so it's important for things to line up. 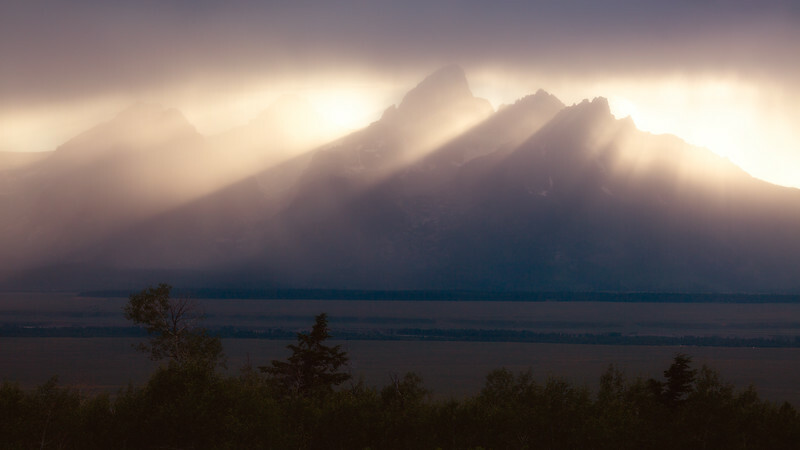 On this evening, I was happy to have the conditions that I did.